READ MORE... Known by the name of &apos;harp&apos; or some word near it [...] such as &apos;harfe&apos; in Germany, &apos;harpa&apos; in Iceland, or &apos;arpa&apos; in Spain, except in gaelic-speaking Scotland and Ireland, where it is called &apos;clarsach&apos;. Clarsachs predate bagpipes and fiddles. Long ago, they were predominant in Scotland and Ireland. The clarsach was small and easily carried, a feature traveling troubadours valued. Bards were honored members of a patron&apos;s household. Treasure this tradition and let the music play. READ MORE... The national flag of Scotland is the cross of St. Andrew, also known as the Saltire. The belief is this flag is [...] one of the oldest national flags in the world, as it dates to the 12th century A.D. In answer to the prayers of the Scottish army, St. Andrew appeared to them in dreams, the night before they met the English in battle. 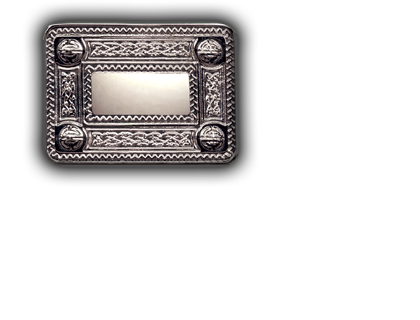 At the moment before the forces were engaged, a white diagonal cross appeared overhead against the blue sky, clearly seen by both armies. Now you can share in the vision. READ MORE... Elusive spirit of the Celtic forest. Majestic vision and earthly connection between the race of men and the Otherworld [...] Sidhe. 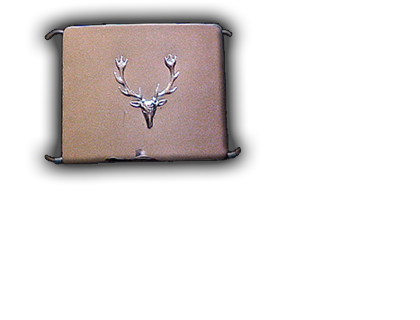 Ensnaring the unwary, the Stag leads the &apos;Wild Hunt&apos;:: characterized even in today&apos;s popular folk music through the lyrics of &apos;Ghost Riders in the Sky&apos;. Now you can wear it -Don't be caught without this incarnation of the enduring racial memory. READ MORE... On June 7, 1329, Robert de Brus -perhaps Scotland's most famous king- departed this life. As he had wished, and as every schoolchild knows, [...] his heart was removed (to be carried by &apos;Good Sir James&apos; Douglas to the Holy Land and later buried within Melrose Abbey) and his body interred at Dunfermline. Lost within a few years, the location remained unknown until the middle of the 19th century. 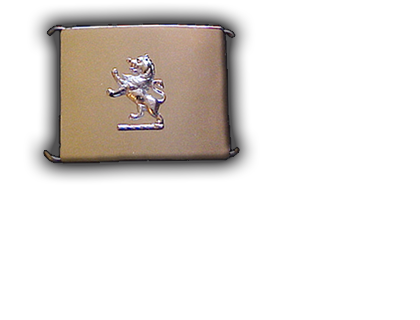 Find the spirit of the Lion, and wear it with Pride. 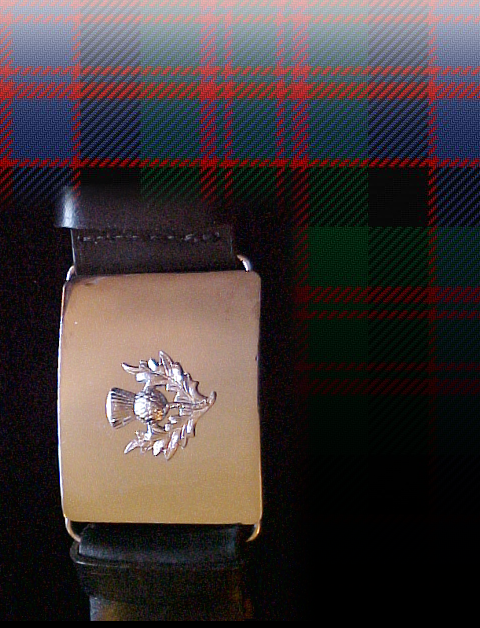 Ready for your engraving or attach your own Clan Badge or Society Emblem. Who needs tattos? Show us what you&apos;ve got! READ MORE... Long ago, it is said, an invading party of Danes sought one night to take a slumbering Scottish encampment, [...] patrolled by but one sentry. The Danes crept upon them, noiselessly barefooted. Then in the dark, one man trod on a thistle and let out a howl of pain. Alerted to danger, the hardy Scots leaped from their sleep, fell upon the raiders, and defeated them with terrible slaughter. 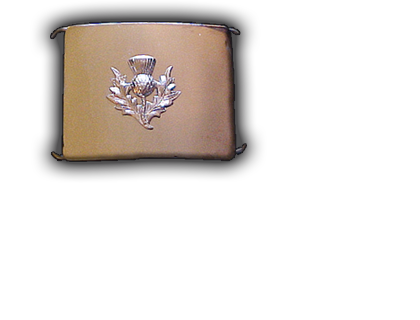 Known forever as the Guardian Thistle, now you can wear it. 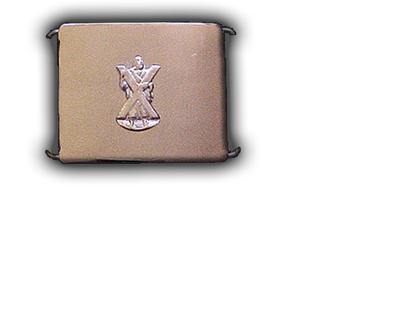 2½ Inch Kilt Belts. Your Choice of Chrome Buckles. Black heavy belt-weight leather :: fits upto 60" WAIST. 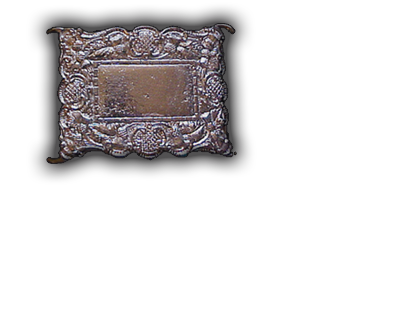 2.5in Chrome Buckle. 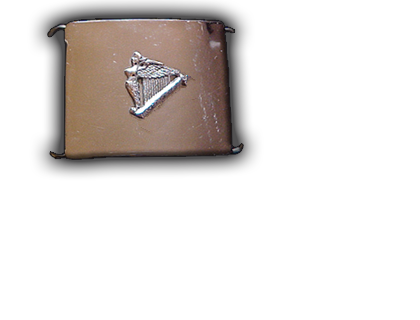 "Celtic Border"
3.0 Inch Kilt Belts. 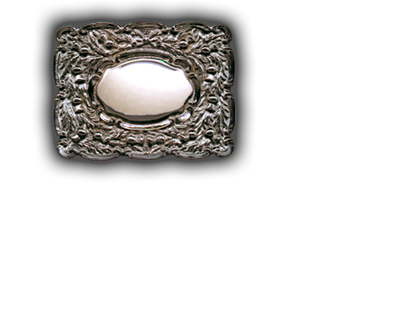 Your Choice of Chrome Buckles. Black heavy belt-weight leather :: fits upto 60" WAIST. 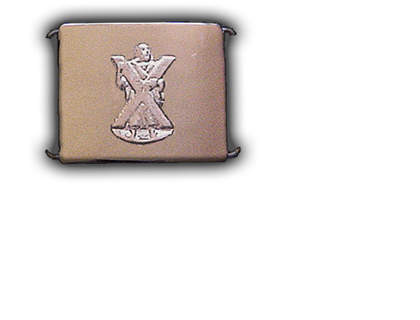 Chrome Buckle USD $60 with Kilt Belt.